I just finished making quite possibly the world's most simple radio. 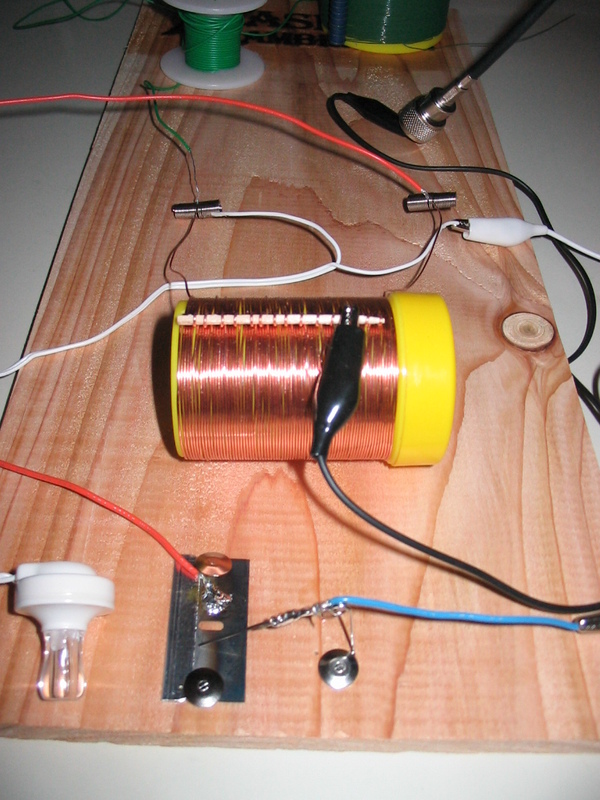 I had read a few HOWTOs for constructing a crystal radio. Some links offered the basic formulas for figuring the specs needed for the coil if you wanted to tune various frequencies. I purchased 3 spools of "Enamel-Coated Magnet Wire" from Radio Shack for ~$5, and picked up a crystal ear piece while at EPO in Houston. After reading that just about any round object will do for a coil-form, and not having an empty toilet paper tube, I settled on an empty fish food container. It was small, compact, and just the right size - plus with the screw on lid, I can keep the antenna, ground and ear piece inside. I rinsed out the fish food residue, tapped 4 small holes with a drill bit and started wrapping the 22awg copper wire around the bottle. Every 5 turns I would wrap around a toothpick. After wrapping the bottle - which took a while - I ended up using about 30ft. of wire. (FWIW: my coil came out to be about 118uH) The toothpick wraps were then scraped free of the enamel coating to make antenna taps for rough tuning. 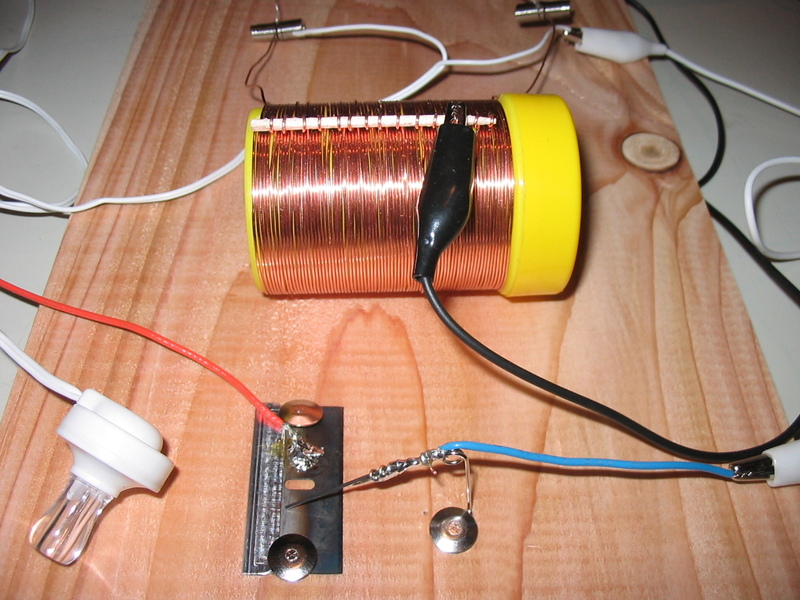 (how this works) After ensuring there were no shorts along the coil body, I hooked up the 1N34 diode, ear-piece, ground wire and antenna and was greeted with some shortwave radio broadcasts. The first station I heard ID was WWCR out of Nashville, Tennesee, although there are plenty of others I can hear. The trouble with such a simple receiver (no variable capacitor) is that there is little selectivity and the listener is bombarded by 2 or more stations at once - a mixing of all of the signals within a range of frequencies. To fix it would add complexity, but it's not hard to do. For my antenna, I just have an 8' wire tacked up to the wall. For my ground, I have an 8' wire precariously plugged into the ground on an electrical outlet (I wouldn't recommend it, but it does work). In the picture, the toothpick is shown on the coil with the wraps every 5 turns. 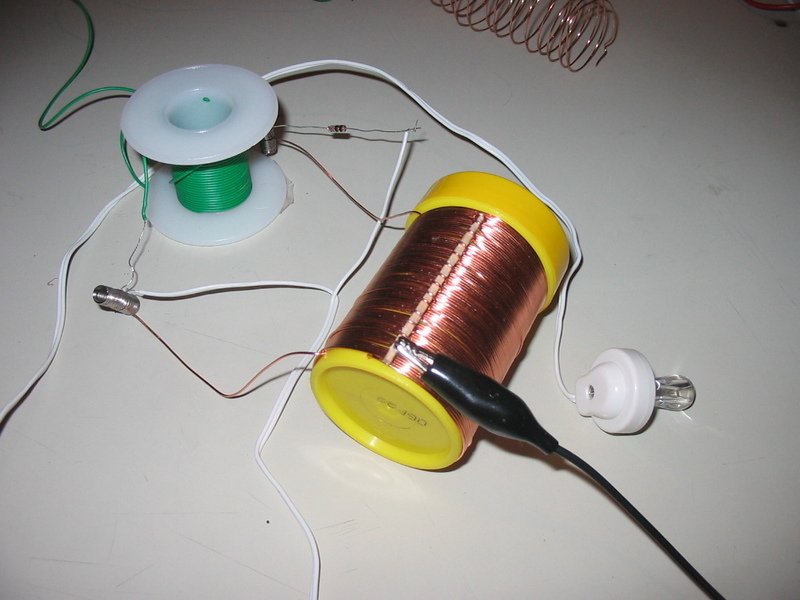 The green wire is my ground, the black alligator clip goes to my antenna wire (the clip makes it easily movable for tuning), the diode is at the top of the coil, next to the green spool, and then of course the white high-impedence ear piece. Also note that no solder was required, I opted to use springs to connect points, but twisting and taping would have worked just as well. If you're interested in trying it out, gather the required parts and let me know how yours turns out. Grendel sez: For my next trick, I hope to swap the diode out for a razor blade and safety pin! The best explanation of how crystal sets work, that I've found so far, is here. update: Success! After trying for an evening, I got the razor blade and saftey pin combo to act as a detector. Here's a picture of the setup. I used regular straight blades (found by more "modern" blades in the shaving section of most stores) and an ordinary safety pin. After reading about the "blued steel" of the WWII-era blades, I learned that the blue hue of the blade was due to a heating treatment that is done to the blade during manufacturing. I wasn't having any luck with my blade so I gripped the blade with pliers, held it horizontally in a flame until I saw the blue appear on top of the blade. I wiped away the black residue from the flame on the bottom and tacked down the blade. Next, I got a small piece of lead from an automatic pencil, connected it to the safety pin via a small dab of solder, tacked down the pin and hooked up the radio. (Blade goes to the ground, pin goes to ear piece.) You have to be patient and fish around the blade for the right point but you'll find it. Tip: Try in the top-center of the blade around the hole in the blade - that's my sweet spot. I've also found out that florist's wire works just as well and is alot cheaper (and more easily found in stores). update: To make it even easier try a Slinky! #769 I have long been fascinated by these fox hole radio setups. Great work!